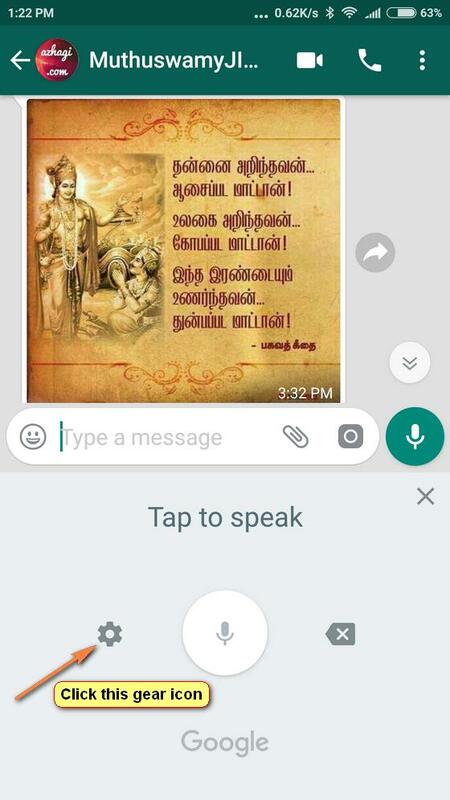 While using Azhagi Android App, apart from typing, you can also speak and create your texts in multiple languages - Tamil, Hindi, English, Arabic, Bengali, Gujarati, Kannada, Malayalam, Marathi, Nepali, Sinhala, Telugu, Urdu^^ and 100 more other languages. All this is possible, thanks to Google. My related post in Azhagi's facebook group is here. (^^) Note: Out of the 24 languages in which you can type using Azhagi+, the abovementioned languages are the ones in which you can effect voice input. User Mr PonThamaraiKannan's testimonials (on availing Google's Tamil Voice Input while using Azhagi Android App) in Azhagi's Facebook Group and Google Play Store are as hereunder. You can click here and here to read the testimonials directly in Azhagi's Facebook group. நமது உச்சரிப்பு சரியாக இருந்தால் பிரச்சனையே இல்லை. இந்த ஆப் பினை படைத்த அழகி அய்யா அவர்கள் மிகவும் பெரிய தமிழ் சேவையாளர் ஆவார். சரியாக பேசினால் சிறிய சந்திப்பிழைகூட இன்றி டைப்பிக்க முடிகிறது. அற்புதமான விசயமாகும். இவரின் சேவை அனைத்து மக்களுக்கும் மிகவும் உபயோகமான விசயம் ஆகும். தற்போது எமது மனதில் உள்ள அனைத்தினையும் எளிதில் எழுத்துக்கள் ஆக்கி விடுகிறேன். நன்றி அய்யா வாழ்க உங்கள் தமிழ்தொண்டு. User Mr KrishnaDasan's testimonial (for Tamil voice input) in Azhagi's Facebook Page is as hereunder. You can click here to read the testimonial directly in Azhagi's Facebook Page. In the area where the suggestions are listed, you can see the 'voice input' mike icon at the right end. Please see screenshot below for better understanding. Click the abovesaid mike icon, as instructed. You will see the following display. Click on the gear icon, as instructed. The following screen will appear. Click on 'Languages'. The list of languages will get displayed. As of now, you can choose up to 5 languages. 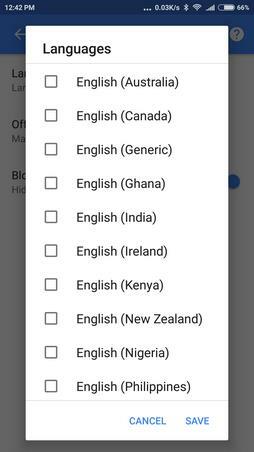 Keep all 'English' boxes unticked. Scroll down the list and select 'Tamil'. Then, click 'SAVE' (at the bottom of the screen). You will see the following screen displayed. Move out of this screen and get back to WhatsApp typing area. Press the 'Voice input' mic icon and start speaking in Tamil (say, raama raama raama raama raama). You will see ராம ராம ராம ராம ராம appearing in your screen. 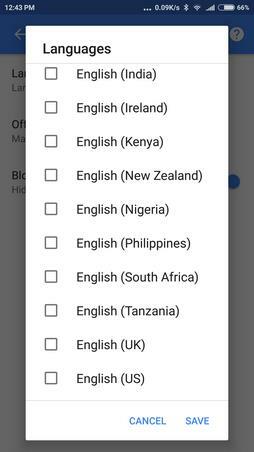 Keep the boxes for your preferred languages (max. 5, as of now) ticked. 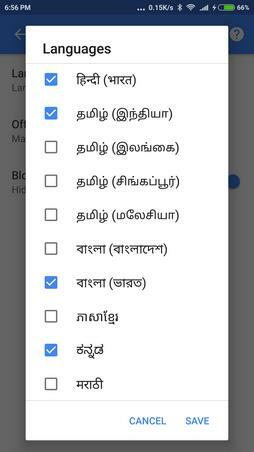 For example, you can keep ticked English, Tamil, Hindi, Bangla and Kannada. Or, you can keep ticked Arabic, Urdu, Zulu, Hindi and Telugu. Choice is yours. 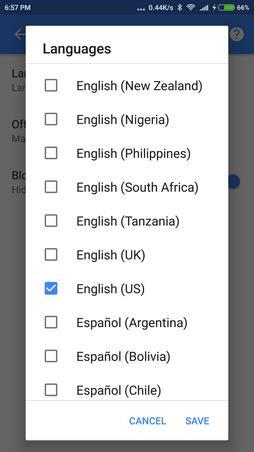 However, after selecting the languages, you need to give your choice for which language you wish to have as your primary language. Assuming you wish to have Tamil as your primary language, you need to "HARD PRESS" the Tamil language and it will get set as your primary language. Click 'SAVE' and exit the languages screen. You will see the following screen displayed. Move out of this screen and get back to WhatsApp typing area. Press the 'Voice input' mic icon and start speaking in your preferred language (say, Tamil). 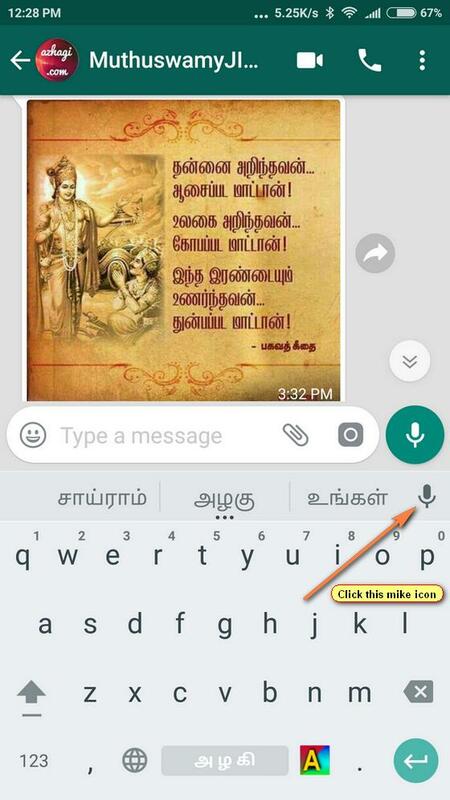 You will see Tamil text appearing in your screen. 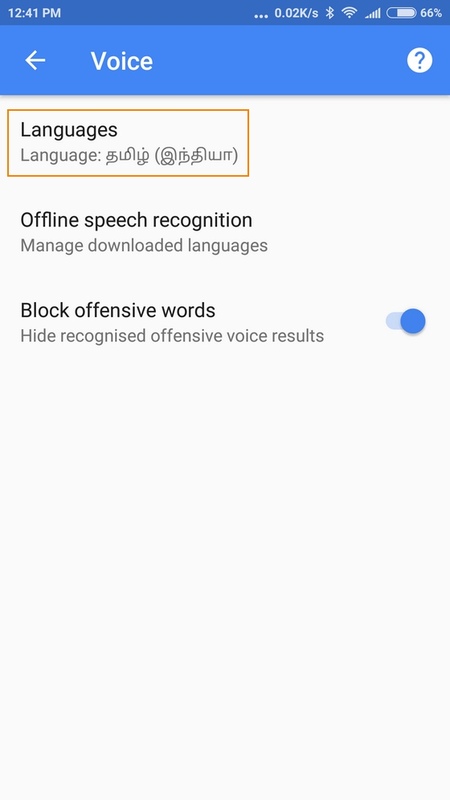 Note-1: In case you could not see the mic icon at the right end of the suggestions area, you might have to enable Google voice typing in your mobile. 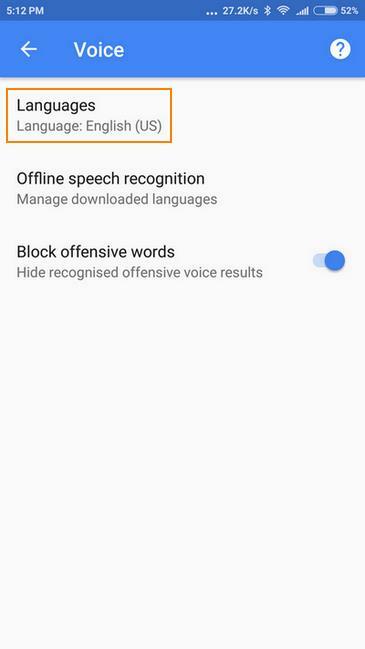 This can be done by reaching 'Settings->Language and input' and ticking the 'Google voice typing' checkbox. 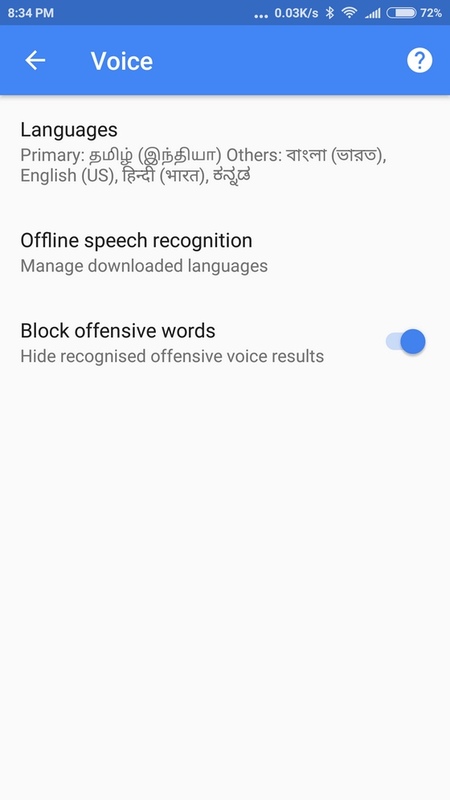 Note-2: I tested the 'voice input' for Hindi (with whatever knowledge of Hindi I have) and it is quite good. For English, it is just excellent. As far as Tamil is concerned, in my humble opinion, the voice input is at an experimental stage only (as of August 2017). 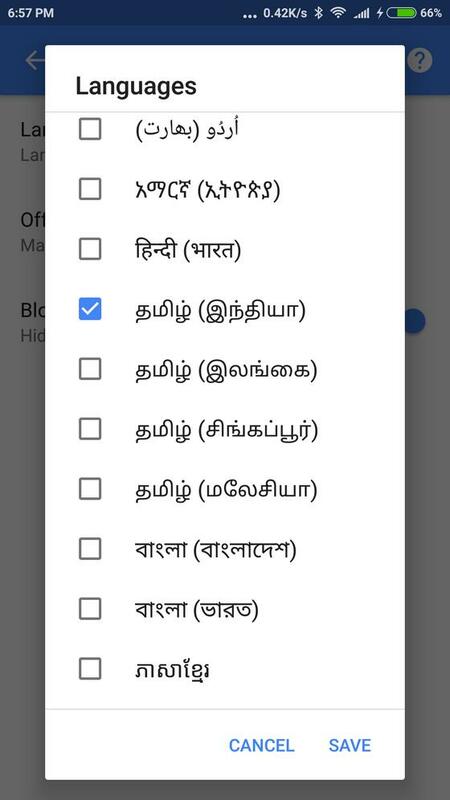 As days go by, with voice samples from millions of users (who are going to try out Tamil voice input in the days to come), Google will definitely enhance and perfect voice input in Tamil, I am sure. The recent testimonials for Azhagi's Tamil voice input here goes to assure the same. Note-3: To type punctuation and kind, I believe we still have to use the keyboard only.